Sorority Dues: A Deterrent for Some, but How Do You Talk About It? You’re chatting up a potential new member for your sorority chapter, and everything’s going great. You seem to have a lot in common. She shares your chapter values. She’s wholesome and nice, a good student. Her taste in music is pretty dope. She’s engaged in the conversation and asking the right questions--that is, until membership dues come up. That question: How much are dues each semester? Don’t get us wrong, it’s a fair question. Depending on the chapter, membership dues can range from hundreds to thousands of dollars. Yet it’s always a bit of a turning point with PNMs. Some ask simply because they’re interested to know, but others may see dues as a deterrent. If you haven’t heard that one, you haven’t been listening. This harmful stereotype is further perpetuated by the fact that sorority chapters operate with some level of secrecy as far as their rituals and internal affairs are concerned. If a young woman isn’t a sorority woman, she likely has little interest in pulling back the curtain to see the truth of how a sorority budget is driven by membership dues. Thus, it’s up to you to show them the light. 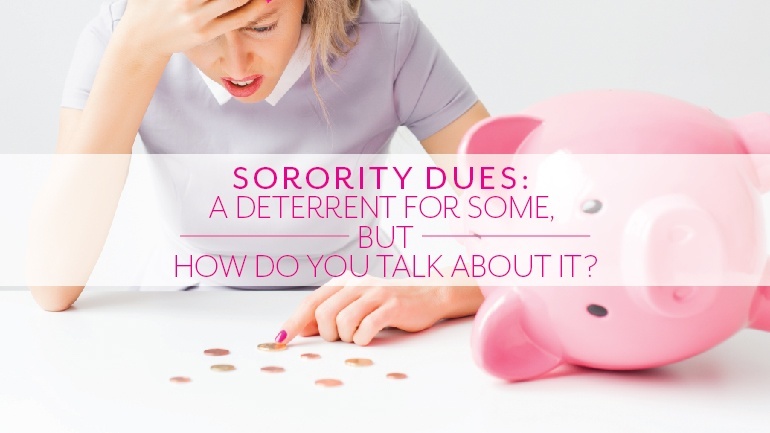 OmegaFi knows that Sorority Dues Are a Deterrent for Some, but we’re here to help you Talk Them Through It. The first misconception you have to squash when someone asks about sorority dues is that sisters are simply “buying friends.” The truth of the matter is that you sisters could be close friends even without membership in a sorority chapter. And even as sisters, you have friends outside the chapter as well. All of your relationships are organic, and they’re strong because you’ve worked hard at them, not because of paying membership dues. PNMs need to understand that paying membership dues each semester is like buying into a small business and seeing immediate returns on your investment. Dues fund a majority of chapter events and activities, such as socials, formals, recruitment events, philanthropies and other functions that keep the chapter going. As a social organization, a sorority benefits sisters directly. Sure, there are extra costs here and there, such as new member fees and buying miscellaneous things like chapter regalia, but for the most part what you pay into the budget is what you get as a sister. And your chapter likely offers incentives like discounts for early dues payments or payment plans. A sorority chapter is not exactly a business. Sisters continuously focus on improving themselves, their sorority, their university and their community. And to build something truly wonderful, they need to start by investing some capital. Recruitment is all about showing young women the value of investing in themselves. Beyond the tangible experiences you get out of joining a sorority chapter on campus, you also get the once-in-a-lifetime experiences of sisterhood and bonding, networking and growth as young collegiate women. This isn’t something you can quantify by looking at the chapter budget, but potential sisters need to understand that sisterhood is so much more than hanging out with a group of friends. That may be part of it, but you get so much more when you become a lettered sorority member. You share deeply held values, goals and experiences that are specific to sorority life. Sorority membership is there to help you grow and learn, to be a better student and to be a stronger leader. Not only that. These qualities follow you throughout life. You’ll also share the bond of sisterhood with many young women across the country, with whom you may be able to network and build professional relationships and opportunities when you graduate and become an alumna. At the end of the day, what you gain from true sisterhood is priceless. You live in a veritable mansion of a sorority house. There are huge Greek-style pillars, a massive chandelier hung over the entryway, golden, winding staircases, marble countertops, a huge brick fireplace, floor-to-ceiling windows, a heated pool and Jacuzzi, and the list goes on and on. On the other hand, the dorm rooms undergraduates pay an arm and a leg to live in are concrete prison cells by comparison. It’s true that sorority houses are lavish compared to your typical dorm room experience, but in reality living in one can often be cheaper. You’ll have to check to see the comparative costs on your campus, but even with a meal plan living in a sorority house can save money over living in a dorm. Some colleges will reimburse rent and unused meal plans as well, and if not, your chapter might consider offering a non-meal-plan option to sisters who may not otherwise be able to swing dues payments. Show potential sisters that your chapter requires membership dues for good reason, and that there’s so much to sisterhood that can’t be summed up by a price tag. While dues may deter some potential sisters from joining who simply can’t afford the cost, that’s not to say joining your sorority isn’t well worth the price of admission. Just be honest, open and straightforward about what sisters pay in and get out of their sorority experiences. Have you had trouble in the past getting past the dues question? How did you handle it? Will you handle it differently in the future? Give us your bottom line in the comments below.